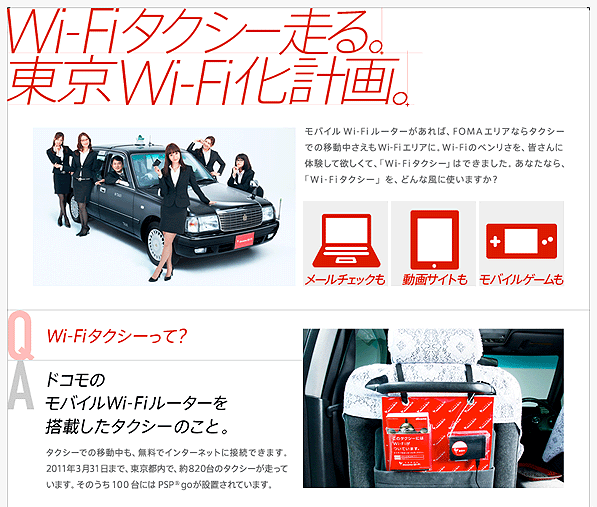 Tokyo Musen and NTT DoCoMo have introduced a free WiFi trial campaign with a fleet of cabs here in the capital city. Running through to March 2011, folks stuck in traffic can connect their devices to an open port from the back seat and enjoy the service.. heck they even toss in a PSP to play for the salarimen kids to play with. Hat-Tip to Ikeda-san for the dig. On first blush this approach reminds us old-skool scribes of the sneaky play, way back in the day, by DDI and IDO who merged with TuKa to form KDDI. They ran an aggressive ad campaign which included outfitting a bunch of Tokyo Taxis with their new CDMA-1 handsets for people to make free calls in order to experience the improved 64kb voice quality over the competitions PDC service offering then at 9kb. The company is now the 2nd largest telco in Japan with 32M subscribers.